E10, a fuel mixture of 10% anhydrous ethanol and 90% gasoline sometimes called gasohol, can be used in the internal combustion engines of most modern automobiles and light-duty vehicles without need for any modification on the engine or fuel system. E10 blends are typically rated as being 2 to 3 octane numbers higher than regular gasoline and are approved for use in all new U.S. automobiles, and mandated in some areas for emissions and other reasons. The E10 blend and lower ethanol content mixtures have been used in several countries, and its use has been primarily driven by the several world energy shortages that have taken place since the 1973 oil crisis. The Tesco chain of supermarkets in the UK have started selling an E5 brand of gasoline marketed as 99 RON super-unleaded. [ citation needed] Its selling price is lower than the other two forms of high-octane unleaded on the market, Shell's V-Power (99 RON) and BP's Ultimate (97 RON). Many petrol stations throughout Australia now also sell E10, typically at a few cents cheaper per litre than regular unleaded. It is more commonly found throughout the state of Queensland due to its large sugarcane farming regions. The use of E10 is also subsidised by the Queensland government. [ citation needed] Many petrol stations no longer offer a "Regular 91" petrol option, instead only offering Regular E10 (91), Premium (95) and Premium (98), although regular unleaded remains commonly available in Victoria. In Sweden, all 95-octane gasoline is E5, while the status of 98-octane fuel is currently unclear. [ citation needed] The product data sheets of the major fuel chains do not clearly state ethanol content of their 98-octane gasoline. In the early-mid-1990s, some fuel chains sold E10. From January 2011, the Fuel Quality Directive (Directive 2009/30/EC) will apply through its transposition into the law of Sweden as a member of the 27 member states of the EU . A 2007 Uruguayan law mandates a minimum of 5% of ethanol blended with gasoline starting in January 2015. The monopolic, state-owned fuel producer ANCAP started blending premium gasoline with 10% of bioethanol in December 2009, which will be available in all the country by early January 2010. The other two gasolines will follow later in 2010. E15 contains 15% ethanol and 85% gasoline. 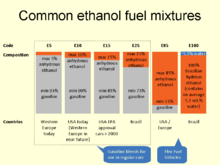 This is generally the highest ratio of ethanol to gasoline that is possible to use in vehicles recommended by some auto manufacturers to run on E10 in the US. This is due to ethanol's hydrophilia and solvent power. A state law approved in Minnesota in 2005 mandated that ethanol comprise 20% of all gasoline sold in this American state beginning in 2013. Successful tests have been conducted to determine the performance under E20 by current vehicles and fuel dispensing equipment designed for E10. However, this mandate was later delayed to 2015, and has never taken effect because the federal EPA has yet to authorize the use of E20 as a replacement for gasoline. The 85% limit in the ethanol content was set to reduce ethanol emissions at low temperatures and to avoid cold starting problems during cold weather, at temperatures lower than 11 °C (52 °F). A further reduction in the ethanol content is used during the winter in regions where temperatures fall below 0 °C (32 °F)  and this blend is called Winter E85, as the fuel is still sold under the E85 label. A winter blend of E70 is mandated in some regions in the US,   while Sweden mandates E75. Some regions in the United States now allow E51 (51% ethanol, 49% gasoline) to be sold as E85 in the winter months. A major restriction hampering sales of E85 flex vehicles or fuelling with E85, is the limited infrastructure available to sell E85 to the public, as by 2014 only 2 percent of motor fuel stations offered E85,  up from about 1 percent in 2011. As of November 2015 [update], there were only 3,218 gasoline fueling stations selling E85 to the public in the entire U.S.,  while about 156,000 retail motor fuel outlets do not offer the E85 blend. The number of E85 grew from 1,229 in 2007 to 2,442 in 2011, but only increased by 7% from 2011 to 2013, when the total reached 2,625. There is a great concentration of E85 stations in the Corn Belt states, and as of November 2015 [update], the leading state is Minnesota with 274 stations, followed by Michigan with 231, Illinois with 225, Iowa with 204, Indiana with 188, Texas with 181, Wisconsin with 152, and Ohio with 126. Only eight states do not have E85 available to the public, Alaska, Delaware, Hawaii, Montana, Maine, New Hampshire, Rhode Island, and Vermont. The main constraint for a more rapid expansion of E85 availability is that it requires dedicated storage tanks at filling stations,  at an estimated cost of US$60,000 for each dedicated ethanol tank. A study conducted by the U.S. Department of Energy concluded that every service station in America could be converted to handle E85 at a cost of $3.4 billion to $10.1 billion. ED95 designates a blend of 95% ethanol and 5% ignition improver; it is used in modified diesel engines where high compression is used to ignite the fuel,  as opposed to the operation of gasoline engines, where spark plugs are used. This fuel was developed by Swedish ethanol producer SEKAB. Because of the high ignition temperatures of pure ethanol, the addition of ignition improver is necessary for successful diesel engine operation. A diesel engine running on ethanol also has a higher compression ratio and an adapted fuel system. The Brazilian 2008 Honda Civic flex-fuel has outside access to the secondary reservoir gasoline tank in the front right side shown by the arrow. ^ "E85 Prices". E85Prices.com. Archived from the original on 2014-07-01. Retrieved 2015-11-23. As of 23 November 2015 [update], there were 3,218 stations Selling E85 across 2013 cities in the U.S.
^ Agência Nacional do Petróleo, Gás Natural e Biocombustíveis (ANP) (2005-12-06). "Resolução ANP Nº 36, Delaware 6.12.2005 - DOU 7.12.2005" (in Portuguese). ANP. doi: 10.1048/enu (inactive 2019-02-10). Archived from the original on 2008-10-01. Retrieved 2008-11-15. See Table I – Specifications for AEAC and AEHC at "Anexo: Regulamente Técnico ANP Nº 7/2005.